If there’s one thing that us Leicester folk are proud to call our own it’s Walkers Crisps right? 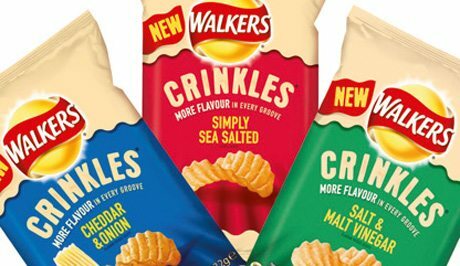 Well now they’ve got a brand new selection out for you in the form of Walkers Crinkles, have you tried them yet? What’s even more exciting is that we’ve got a box of them to give away to you! A whole box that contains, wait for it… 96 bags! Walkers Crinkles come in 4 different flavours – Simply Sea Salted, Cheddar & Onion, Salt & Malt Vinegar, and Sweet Chilli. With a slightly thicker cut and more flavour in each groove, the Walker’s crinkles provide a great new alternative to your traditional bag of crisps. We guarantee you won’t be disappointed. The lovely folks at Walkers sent us over a box to try (the Salt & Malt vinegar was our favourite flavour) and we couldn’t wait to get our hands on more to give to one of our readers! In the traditional packets of Walkers which flavour comes in a blue bag? The closing date for entries is Friday 12th August and please write “Walkers” in the subject line.